Thank you to everyone, for your kind words and support. A few readers have mentioned that they're interested in purchasing Australian Homespun, but unable to find it in their country. Well, the good news is that Australian Homespun is available in digital format now – all you have to do is log on to www.zinio.com.au and you can purchase single copies or even take out a subscription for a great price. Just search for Homespun up in the search field (or try THIS link which will take you directly to the latest issue). I've had a secret, for months now, which I hadn't been able to tell you. It's an exciting secret and yesterday I received the final product, so I can finally divulge all of the details with you. You know that I have had other projects published in the past, but this is the first one I have had in Australian Homespun. 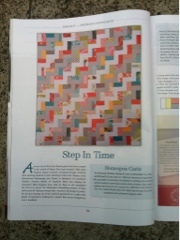 I'm so pleased to see my quilt and name in the glossy pages of Australian Homespun. Seriously, cool! And not only is it in there, it's on the front cover!! It's the one hanging up on the right, in the picture below. 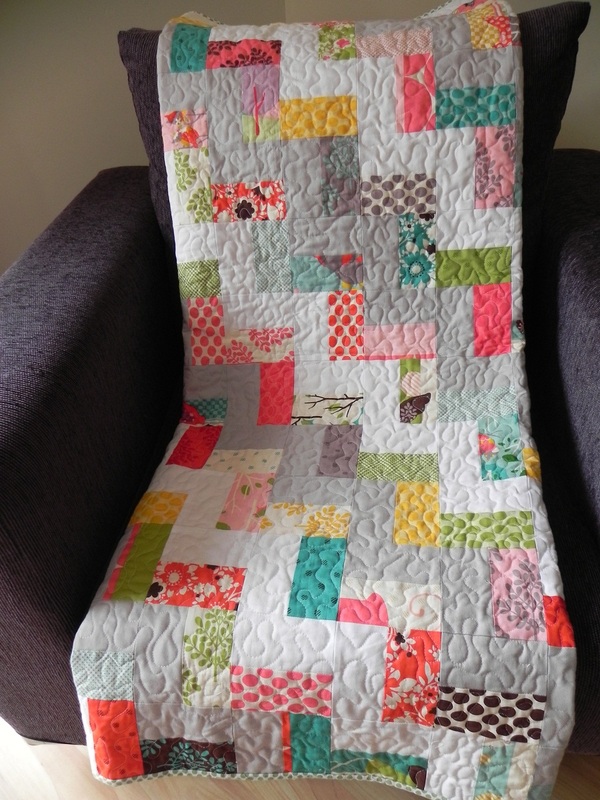 The quilt is called "Step in Time" and is a fun and simple design. In my quilt, I used 2 charm packs of "It's a Hoot" by MoMo and yardage of Kona White and Kona Ash. This issue of Australian Homespun went on sale yesterday. Ohh congratulations!!!! Must get a copy!!! It's gorgeous Anorina - and sooooo exciting to make the front cover! Congratulations!! Well done. I also pointed out to people in Coles that it was your quilt on this months Homespun. Yay! I took it into to school when I picked up the kids to show the mums. Most of them just though I was crazy (they obviously don't understand the joy of quilting). Congratulations! You should be very proud of yourself. Job well done. Congratulations! What a beautiful quilt. I'm not surprised that it is on the cover! Congratulations! I know exactly how you feel since I too was on the cover a few months back. Enjoy the limelight! You sooooo deserve it! Thanks Carol. Can you believe I literally just sent you a message on Flickr!?!?! We're on the same wave length. Congratulations. Front cover is wonderful. I'm so sorry I can't buy the magazine here in Portugal. Wow - a "Cover Girl"!! Easy, Breezy, Beautiful (well, maybe not the easy part - ha ha). The quilt looks wonderful!!!! Congratulations on all your hard work! HUGE Congratulations! what a thrill! Congratulations! This is huge! But you deserve it, the quilt is beautiful! Well done Anorina, another great pattern! Congratulations, It is a beauty! Congratulations! I'll have to pop over to my LQS to see if it's arrived yet. Congratulations. It's a lovely feeling I know to see your own creation on the pages of a much loved and admired magazine. Well done. Bask in your glory... you deserve it. Congratulations! I wish it was on sale here in Sweden. Congrats! It's lovely, and a very nice achievement! How exciting! It's a lovely quilt and I really like the colors! OMG!! You are on the front cover!! Too cool indeed! Congratulations! I love your quilt - the colours are fabulous! Oh WOW. Congratulations, I am so happy for you. I remember how excited I was when my shops ad first came out. I paid to have it put in, so HOW EXTRA excited must you be. Congratulations. The quilt looks lovely and the photos are great. Congratulations Anorina! It looks fantastic - I can't wait to get my copy now! Your talent is no secret--I'm thrilled for you that all the world can see it now, right there on the cover! I feel quite proud of you, and can only imagine how you must feel. I'll be on the lookout for the magazine here in Oregon, USA. It's gorgeous! Congratulations! What an amazing accomplishment! Have a blessed day (I know you are already...)!!! Congratulations Anorina! I'm sure many readers of Homespun will be inspired to give this design a go... Clever thing, you Cover Girl! I saw this in my copy today! Congratulations Anorina!!! It's great! Congratulations!! It's a very pretty quilt. How exciting to be on the cover!! COngratulations Anorina, that looks like a lovely [pattern, will have to check it out. I am obsessed with this quilt and would love to make it. Is there a way to get an issue of this copy of Homespun shipped to the US? Or to get a pdf copy of the pattern? I just jumped online to wish you congratulations! I'm glad you have also done a blog post on your publication. Great work and a lovely quilt (which I must say looks even better on your photo!). Well done. I came here from your post of today! I seemed to havemissed this one. Congratulations.